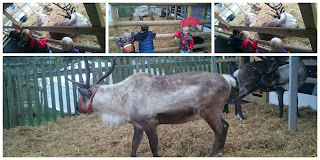 Today I took the children to Hatton Adventure World for their Christmas festivities. The children as per usual had no idea where we were going so the car journey was a big game of guess where we could be going today. 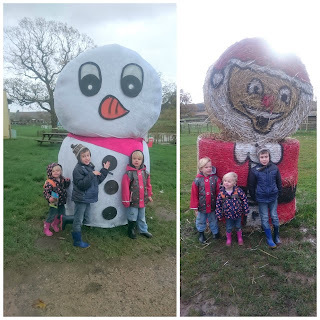 We arrived at Hatton Adventure World with the children still thinking we were going to Lego Land, Cadbury World, Cbeebies Land or wherever else they had guessed but not the right guess as I informed them as I parked the car. 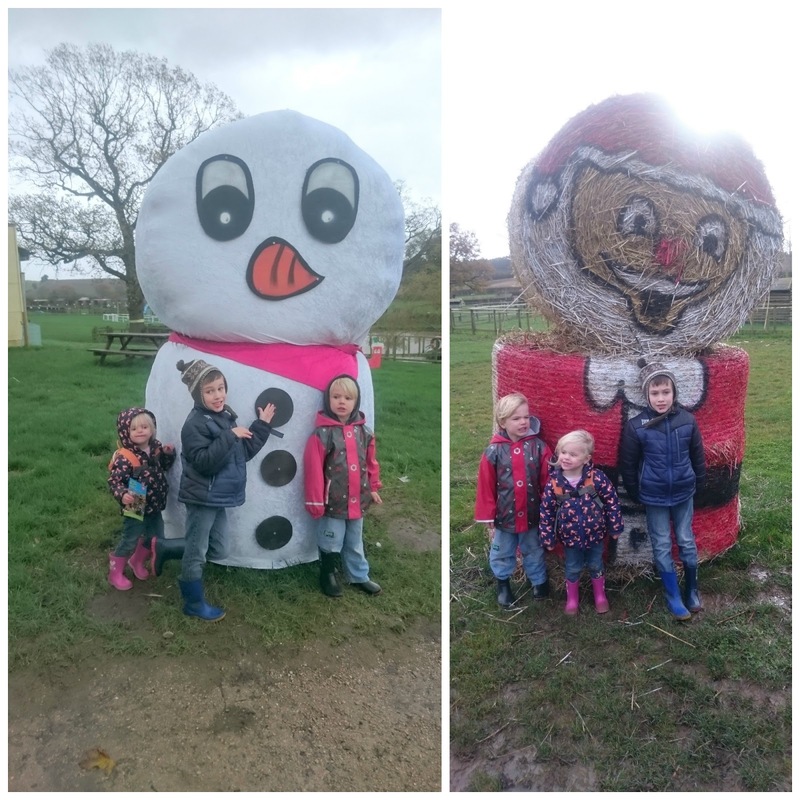 We were booked in to see Santa at 11 am, as it was only 10.30 we had a walk round the farm and saw rabbits, goats, chickens, guinea pigs, pigs and donkeys. 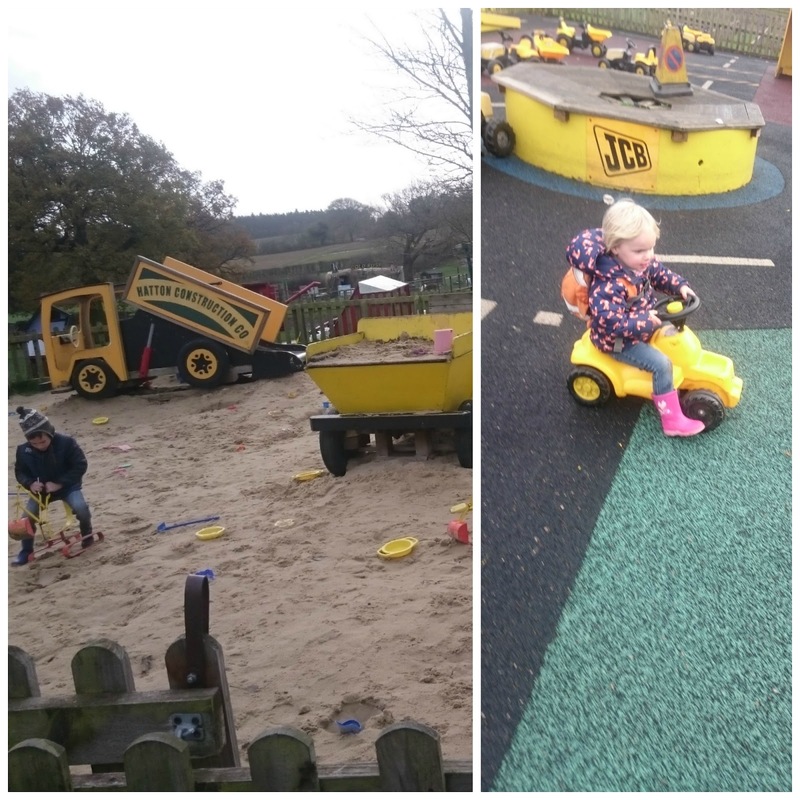 Then the children decided they wanted to play on the JCB area followed by the giant sand pit area, why not I thought so they did. Well before we saw Santa we stopped off in the festive arts and crafts tent and the children happily sat and made Christmas cards for mummy, each their own design too. 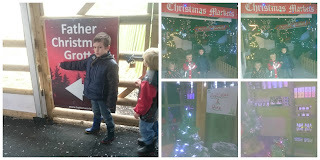 Well it was that time, the time all children love, the time to visit Father Christmas himself. 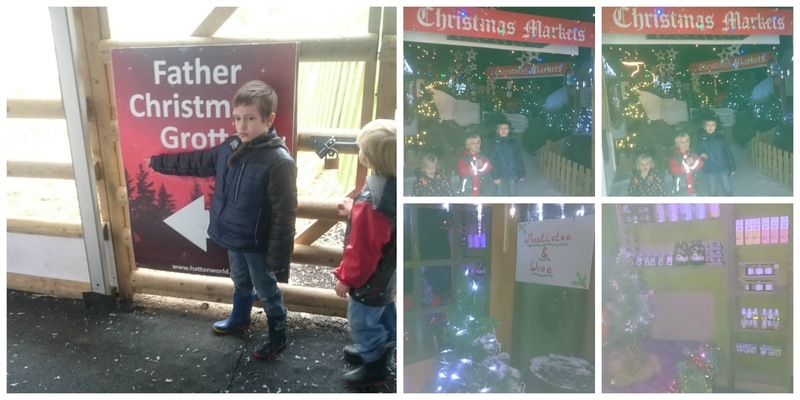 They were so excited, they loved walking through the Elf Workshop area and chatting to Santa's helpers about Christmas and what they wanted this year. 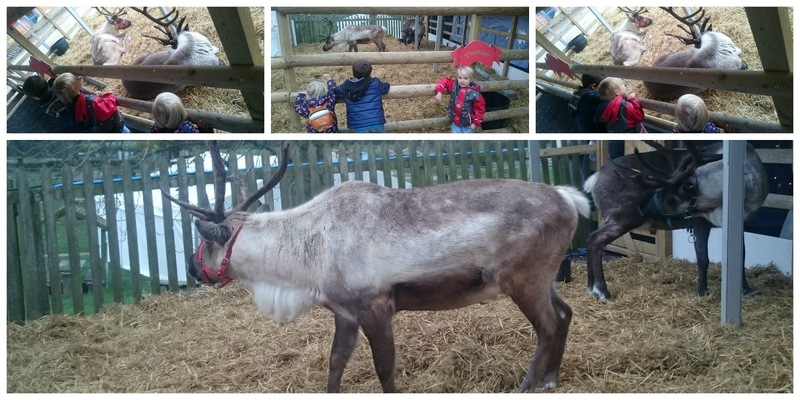 Before we were took through to see Santa there was one last surprise awaiting the children, real reindeer, they were in ore of them, they wanted to stay there and chat to them and stroke them more than going to see Santa I think. Once they were in Santa's grotto they didn't want to shut up they wanted to tell Santa everything on their Christmas list to the point there were no presents left to ask for. Then they had their photo took with Santa then he checked the good/bad boy's and girl's list and told them they had been very good this year, to be honest I think he was looking at the wrong list lol, anyhow he gave them their own special key for them to take to the elf's workshop and wished them a Merry Christmas in return TP told him we had a special key for our house so he can deliver their toys to them on Christmas Eve. In the elf's workshop they were so excited, there were shelves and shelves full to the rim of toys of all sizes, shapes and variety. They wanted this one and that one, "no daddy I now want this one" "are you sure I replied" to which I got in reply "no daddy I've changed my mind" eventually they all decided what they wanted and they exchanged their golden key for their chosen present. 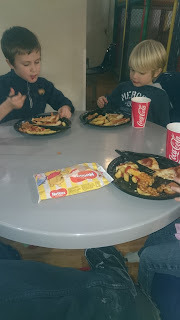 As the weather wasn't too great today, in fact it was gale force winds outside, well it felt like it anyhow, I took the children indoors into the big soft play area where they happily played then had a pizza lunch. 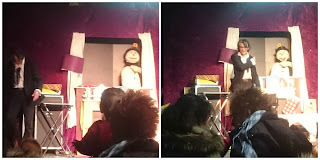 After lunch we went to a Christmas storytelling show, the story being read today was about a brother and sister who build a snowman on Christmas Eve. 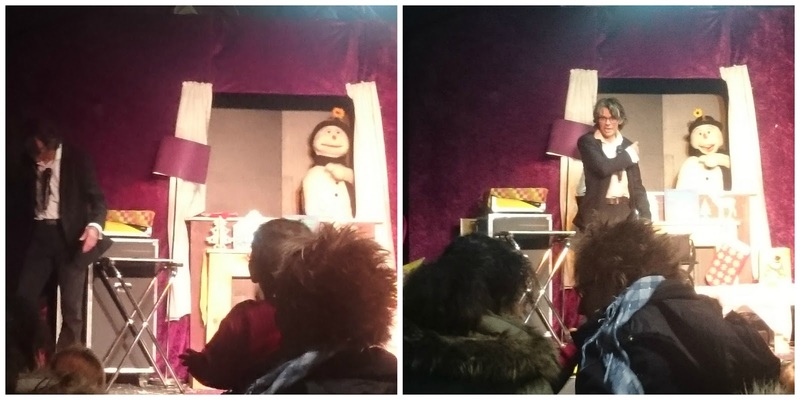 The kids loved this storytelling time as it was a fun show and contained a puppet snowman who interacted with the kids throughout the story. Well after this show we had a look round the Christmas market, I brought the children some sweets and we headed home after a lovely day out. Today was the day that I ventured out alone with all three of my monsters, I didn't just venture to the local shops, Oh No..... I took them on a train to Birmingham and then on to the theatre to see Peppa Pig Live. To be fair they were good, they had their moments but what 3, 5 and 7 year old doesn't lol plus they were very excited that they were going on a journey but had no idea where although for a some reason TP thought we were going to Cbeebies Land and JR thought we were going to Lego Land, where they thought that up from I've no idea. Well as I said our journey began at our local train station where we boarded the train and headed to Birmingham, the journey was made more interesting by TP gluing himself to the window at every stop and trying to convince me it was Birmingham, he was stumped when we arrived and I agreed that it was indeed our stop lol. Well we made our way to the theatre to collect our tickets, I would like to say a massive thank you at this point to Michelle @SeeingRainbows for running her competition which I was lucky enough to win which enabled me to treat my kids to this fabulous day out. When we arrived at the theatre, the kids were so excited when they realised they were going to see Peppa Pig Live that when I told them it didn't start for another hour they were absolutely gutted. Well to pass the time away for a bit I decided it would be fun to stop off at Nostalgia & Comics, oh my oh my why oh why did I think that? (My kids are fastly growing up and becoming Marvel fans thanks to their mum and her partners loving of Marvel) once they entered inside the shop the three of them were in ore of everything they didn't know which way to go first bless them. Figures, comics, books, badges you name it they wanted lol, it kept them amused for a bit so thst was good to be honest. Well we made our way back to the theatre ready to take our seats for the show. The show itself was great, ( I won't spoil it incase anyones going to see it) it was full of dancing and singing and lots of audience participation. My three never stayed still, they were clapping abd cheering, dancing and singing they absolutely loved it from start to finish they even moaned that there was an interval cause they were enjoying it so much lol. After the show we made our way back towards the train station but we made a slight detour as it was dark I walked them through the German Market to see all the lovely stalls lit up at night, it is a lovely sight to see and it does get you in the Christmas mood to be fair lol. My children love having stories read to them, yes they might be old enough now to read stories for themselves but nothing beats tucking your children into their cosy beds and reading them a bedtime story. This evenings story was called Oddsockosaurus by Zanib Mian and Bill Bolton and published by Sweet Apple Publishers. When I was reading this book to my five year old son his little face kept lighting up every time he saw a dinosaur in the book that reminded him of himself, I keep saying is that you and he'd reply "no daddy" with a little smile on his face. This book was a really fun and enjoyable book not only to read but also to use to interact with my son with. This book is priced at £6.99 and I think it is a good price for a fun bedtime story book. I was sent this book for review purpose only and all views are my own. As we all know Autumn leading into Winter brings with it many changes in the weather and with these changes in the weather it inevitably brings with it those dreaded winter cold and flu bugs. As all of us with children are fully aware by now this time of year sees the playgrounds and play group centres full of little ones bunged up with those lovely winter colds and flu viruses, one way you can help prepare yourselves at home to help prevent the spread of bacteria in colds and flu viruses is by using Dettol Surface Cleaners which helps kill 99.9% of bacteria. Did you know that according to the Office of National Statistics over 27 million days of work are missed each year and close to 15 million school days are missed too due to colds and illnesses. During the season of colds and flu viruses, the flu virus can spread on unclean surfaces with the flu virus living on your surfaces for upto 2 days and the cold virus living on your surfaces for upto 7 yes 7 days. So this winter fight back with Dettol Surface Cleaners and prevent your surfaces and your house becoming a virus breading ground. To help prevent the spread of winter viruses this winter in my house I shall be using Dettol Antibacterial Surface Cleanser and Dettol Antibacterial Surface Wipes. I would say that for a deep clean the Antibacterial Surface Cleanser is the more effective product but equally the Antibacterial Cleansing Surface Wipes are a quicker and easier alternative. I was sent these products free of charge for review purpose and at the time of this post the products ranged between £1.00 on special offers to £3.00 in various super markets. I do honesty believe this reflects other products prices out there so they are good value for money and even better if you can help protect your family for less whilst their on special offers.